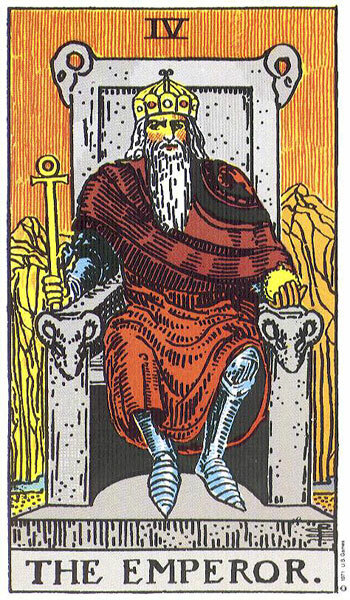 The Emperor card represents male ambition and more specifically the desire to conquer, expand, and rule a kingdom. This drive often creates conflicts and territorial disputes. The Emperor tarot card also represents fatherhood and the role of a protector. Below you can view the various artistic interpretations of the Emperor card. The Emperor is ambition and aspirations for life experience. The potency of life energy. His power is the ability to act. He is the dominant male archetype. He contains the memory of anger and lust. The Emperor shoots for the top of the mountain, for the sun! He is the thirst for adventure and exploration. The eagerness to go forth, to move, to charge ahead, to be a success. He can soar like an eagle. He is a warrior king who fights for power. The war he fights is with the self. He sits on the throne of the ram. He is the invincible strength of the yogi. The active magician initiates the journey and then transmutes into the receptive priestess. The dancing empress is the catalyst energy. The result of this process is the vigorous emperor. He integrates and embodies the first four steps of the path. Can you contain and discipline the masculine energies? Are you eager to be off, exploring the challenges of life?